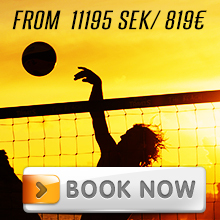 National championships gold in 2008, National championships silver in 2011, three Swedish Beach Tour wins, 23 World Tour contests, Private Trainer of the year @ The Beach in 2009, experience from some of the world’s best coach for 8 years as a professional beach volleyballplayer. What are you looking forward to beach travels in Praia da Rocha? Think it will be the best training trip ever. All components are available, great place, great weather, wind,good instructors = awesome potential to become a good player.